Hanuman is the symbol of strength and energy. Hanuman is said to be able to assume any form at will, wield rocks, move mountains, dart through the air, seize the clouds and rival Garuda in swiftness of flight. He is worshipped as a deity with magical powers and the ability to conquer evil spirits. Hanuman Jayanthi is celebrated to commemorate the birth ofHanuman, the Vanara god, widely venerated throughout India. The event is celebrated on the 15th day of the Shukla Paksha, during the month of Chaitra (the Chaitra Pournimaa). Hanuman is one of the Chiranjivi. He is the son of Anjana and Kesari, and is also described as the son of the wind-god Pavan, who according to several stories, played a role in his birth. One legend is that Indra , the king of the gods, struck Hanuman’s jaw during his childhood. The child received his name from the Sanskrit words Hanu (“jaw”) and -man (or -mant, “prominent” or “disfigured”). The name thus means “one with prominent or disfigured jaw”. Another theory says the name derives from the Sanskrit words Han (“killed” or “destroyed”) and maana (pride); the name implies “one whose pride was destroyed. Hanuman was born to the anjaneri mountain. His mother Anjana was an apsara who was born on earth due to a curse. She was redeemed from this curse on giving birth to a son. The Valmiki Ramayana states that his father Kesari was the son of Rahu, he was the King of a place named Sumeru. Anjana performed intense prayers lasting 12 long years to Shiva to get a child. Pleased with their devotion, Shiva granted them the boon they sought. Hanuman, in another interpretation, is the incarnation or reflection of Shiva himself. Hanuman is often called the son of the deity Vayu (Wind God); several different traditions account for the Vayu’s role in Hanuman’s birth. One story mentioned in Eknath’s Bhavartha Ramayana (16th century CE) states that when Anjana was worshiping Shiva, the King Dashratha of Ayodhya was also performing the ritual of Putrakama Yagna in order to have children. As a result, he received some sacred pudding (Payasam) to be shared by his three wives, leading to the births of Rama, Lakshmana, Bharata, and Shatrughna. By divine ordinance, a Kite snatched a fragment of that pudding and dropped it while flying over the forest where Anjana was engaged in worship. Vayu, the Hindu deity of the wind, delivered the falling pudding to the outstretched hands of Anjana, who consumed it. Hanuman was born to her as a result. As a child, believing the Sun to be a ripe Mango, Hanuman pursued it in order to eat it. Rahu, a Vedic planet corresponding to an eclipse, was at that time seeking out the sun as well, and he clashed with Hanuman. Hanuman thrashed Rahu and went to take the sun in his mouth. Rahu approached Indra, king of devas, and complained that a monkey child stopped him from taking on Sun, preventing the scheduled eclipse. This enraged Indra, who responded by throwing the Vajra (thunderbolt) at Hanuman, which struck his jaw. He fell back down to the earth and became unconscious. A permanent mark was left on his chin, due to impact of Vajra, explaining his name. Upset over the attack, Hanuman’s father figure Vayu deva (the deity of air) went into seclusion, withdrawing air along with him. As living beings began to asphyxiate, Indra withdrew the effect of his thunderbolt. The devas then revived Hanuman and blessed him with multiple boons to appease Vayu. Bow down to Hanumān, who is the slayer of demons, and who is present with head bowed and eyes full of flowing tears wherever the fame of Rāma is sung. Why Hanuman is covered with Sindoor all over the body: When Hanuman saw Sita applying Sindoor (Vermillion) in her hair, he asked the reason for the same. Sita replied that it was for long life and well being of Lord Rama, her husband. Hanuman, the biggest devotee of Rama thought if a pinch of sindoor in the hair can increase the longevity of Lord Rama then why not apply on the entire body. He then applied sindoor all over his body for Rama’s long life. Seeing this innocence and unmatched devotion of Hanuman, Lord Rama gave him a vardan (blessings) that whenever the name of devotion takes place, Hanuman’s name will be taken first. Also, whoever will pay respect to Hanuman on Tuesday, not only will his/her wishes come true but will also be dear to Lord Rama himself. Although Hanuman was a Brahmachari ,he has a son Makardhwaja — Hanuman’s Son Makar Dhwaja was born to a mighty fish of the same name when Hanuman after burning the entire Lanka with his tail had dipped in the sea to cool off his body. It is said that his sweat was swallowed by the fish and thus was Makar Dhwaja conceived. The fish was caught by Ravana’s step brother Ahiravana who ruled Patal, the nether world. When Makar Dhwaja grew up, Ahiravana was impressed by his strength and virility. He then made him his soldier. Hanuman was a great bhakt of Lord Surya and respected him as a teacher. The Sun God agreed to teach all divine knowledge to Hanuman if he could follow the movement of the Sun. Hanuman did so and Lord Surya was greatly impressed by his strength and devotion. According to legend, Hanuman is one of the four people to have heard the Bhagwad Gita from Krishna and seen the Vishvarupa form, the other three being Arjuna, Sanjaya and Barbarika son of Ghatotkacha. The Narada Purana describes Hanuman as a master of vocal music, and as an embodiment of the combined power of Shiva and Vishnu. His greatest feat is when he moved an entire mountain to heal Rama’s brother.Lakshmana had been seriously wounded in the battle against the evil Ravana, and in order to save his life, a certain herb named Sanjeevani was needed from a mountaintop. However, when he got to the mountain he realized that he couldn’t distinguish between any of the plants. So instead of guessing, he grew to a much larger form and picked up the entire mountain and brought it back to Rama. Hanuman’s Hunger Tale — Once during Sita’s exile, Hanuman went to meet her in priest Valmiki’s cottage. Sita was overwhelmed with happiness to see him and cooked many delicacies for Hanuman. Sita continued to serve food to Hanuman and was at the verge of exhausting all the food supplies but was unable to satiate his hunger. In despair, she prayed to Lord Ram who advised her to add a Tulsi leaf in the food being served to Hanuman. Since Tulsi is offered to the Lord and Hanuman was a die-hard follower of Ram, Sita was finally able to gratify the hungry Hanuman. Panch-Mukhi (Five Headed) Hanuman — The demon king Ravan had sent his brother Ahiravan to capture Ram and Lakshman. Acting on his brother’s advice, Ahiravan held Ram and Lakshman in captivity, in the Nether world. Hanuman was determined to save his Lord but in order to kill Ahiravan one needed to extinguish five lamps in five different directions. Thus Hanuman adopted the panch-mukhi form to achieve this and defeated Ahiravan. The four other faces are believed to be of Garuda, Narsimha, Varaha and Hayagriva, which face the north, south, east, west and the sky. Hanuman’s Promise To Ram — When Ram decided to leave for the heavenly abode, many including his wife Sita and Lakshman followed him. But his most ardent devotee vowed that he would stay on this earth for as long as the name of Rama is chanted by its inhabitants. Hanuman is one among the Chiranjivis or immortals, according to the Hindu traditions, who resides in this world protecting us from the evils. The Hanuman Chalisa — Hanuman Chalisa is one of the great poetic works ofSant Tulsidas. Hanuman Chalisa holds a special place and importance in the Hindu religion. Reciting Hanuman Chalisa also helps in overcoming the bad effects of the Saturn. As Tuesday is considered as the day of Lord Hanuman, it is the best way to devote the time and thoughts to impress Him and win His heart. Each verse of the Hanuman Chalisa has it’s own importance. It is said that the recitation of the Hanuman Chalisa at night has some miraculous effect on the person. However, there are many people especially men who take bath early in the morning on Tuesdays and Saturdays, and then recite the Hanuman Chalisa. It wards off Spirits – Lord Hanuman is considered as a God who helps get rid of evils and spirits that can be harmful. Reduce Effects of Sade Sati: It is said that worshiping Lord Hanuman is one of the best ways to impress Shani Dev and reduce the effects of Sade Sati. According to the stories, Lord Hanuman saved the life of Shani Dev and this when Shani Dev said that He will not harm a true devotee of Hanuman. Forgive Sins: We all commit sins knowingly and unknowingly. You can ask for forgiveness by reciting the Hanuman Chalisa. Reciting the opening verses of the Hanuman Chalisa at night at least 8 times helps to remove the sins you may have committed. Remove Obstacles: If one recites Hanuman Chalisa at night, he/she is able to get the divine protection of Lord Hanuman and all his/her obstacles are removed. These are few benefits of reciting Hanuman Chalisa. Absolute faith and correct attitude will get you the blessings of the monkey-God and with the recital of Hanuman Chalisa, you can achieve whatever you desire for. 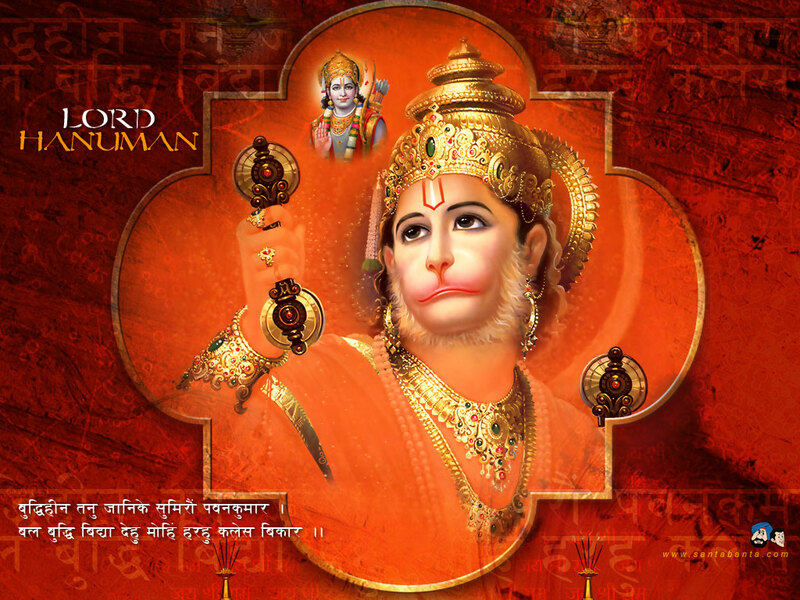 The best time to recite Hanuman Chalisa is in the morning and at night. Those under the evil influences of the Saturn should chant the Hanuman Chalisa at night 8 times on Saturdays for better results. One who will read the Hanuman Chalisa 100 times will be released from all material based sorrows (Kaam, Krodha, Lobh, Mad, Moh, Matsar) and will attend the great satisfaction of heavenly joy. De-stress and maintain good health. Seek protection from harm, distractions and obstacles during a journey or your pursuit of your goals and dreams. Gain wisdom, strength & focus. Seek forgiveness for wrongdoings and showcase and cultivate devotion.